I was intending to change the suspension bushes on the front suspension. Unfortunately, while waiting for some of the suspension bolts to unstick, I made a discovery in the wheel-arch which put that on hold. It's been a while since I had a lamp under the front wheel-arches so while I was waiting for some Plus Gas to work its way into one of the spring pan bolts, I cast a cursory glance around the inside of the arch. It was at this point when I noticed a thin line of surface rust on the join between the front wing and the inner wing. No problem I thought. I got out the steel brush and readied the rust converter and started poking around, following the line. The line went backwards to a flange above the trumpet section. I gave the flange a poke and heard a crunchy sound - not good. A little more poking around and half of that flange came away in my hand (Fig 2), rusted right through, rubber seal still attached. This flange sits parallel to the firewall on top of a box known as the trumpet section, just behind the line of the rear of the wheel -arch and is continued down past the trumpet section and down to the sill level by a splash panel. Both the splash panel and flange are there to prevent the area behind them from being filled by rubbish thrown up by the wheels while on the road. Each has a rubber seal along its edge to weather seal it, but this can contract over time and start to let water into the area behind. Once I knew the flange was bad I took a look at the splash panel and the top of the trumpet section. The trumpet section was sound. A poke at the top of the splash panel made slightly crunchy sounds, but it was pretty solid. 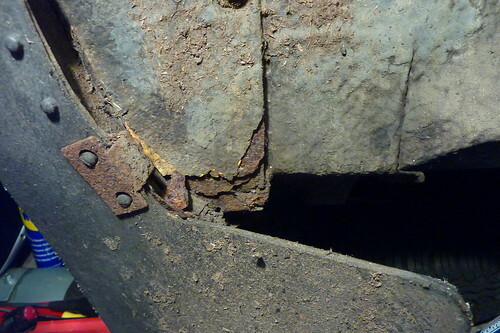 The bottom was different, rust was showing (Fig 1) and made me very nervous as behind that was the sill, which forms one of the primary structural parts of the car. This had the potential of being very serious and very expensive. The bolts holding the splash panel in place sheared off when I tried to undo them but the panel came off (Fig 4), although a little stubborn where the seal had adhered to the wing with underseal. The bottom of the panel was indeed rusted, but removing it revealed a pretty tidy section behind the wing. The only issue was a hole (Fig 5) rusted through the front of the outer sill. But this was the sill - seeing that made me feel physically sick and made me think getting this car back on the road anytime soon was unlikely, never mind the cost involved. No more work on the car today, I really didn't want to look at that hole anymore. A question to the forums overnight made me feel a bit better. The news was that if it was just that hole it would be a minor patch job by a welder. I went back to the car and poked around with a screwdriver through the hole and through the drain holes in the sill from underneath. Sure enough it seemed solid enough, hope springs! I now have the name of a recommended welder and an MG specialist garage, so need to decide what to do. To make the repair the wing will have to come off - even if the weld could be made without removing the wing, I'd feel better if the wing came off to allow a full inspection and clean out of that area. Right now I'm waiting for a couple of dry days so I can take the car out to be inspected without the splash panel in place - I don't want more water getting down there while it's unprotected. The good news is a cursory examination of the other side's splash panel showed no rust and good underseal, so I'm hopeful that this damage is limited to the driver's side. Rust at the bottom of the splash panel, mud guard in front. Rusted flange at the top of the trumpet section. Top-down view from inside the wing, splash guard removed from right. Splash panel removed, showing seal around curved edge. Shot from mud guard, showing hole in outer sill. General photo into section behind splash panel.